The 27.4 metre motor yacht Fair Skies, listed for sale by Cambridge Yacht Group, has been sold in an in-house deal with Steve Doyle acting for both buyer and seller. Built in aluminium by US yard Burger Boat Company to a design by Don O’Keefe, Fair Skies was delivered in 1990 and has long been recognised as one of the yard’s classic yachts. Accommodation is for up to six guests in three cabins consisting of a master suite with a king sized bed and two twins, all with entertainment centres, new HD flatscreen television sets and full en suite bathroom facilities. Her interior features white oak joinery and a comfortable, expansive main saloon with casual dining forward and a gourmet galley, including a large dinette and upgraded appliances. 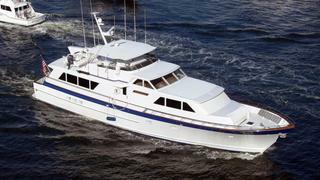 She also features a foredeck seating area with massive storage under and behind. In 2017 the galley appliances were replaced, there is new flooring in the galley, dinette and foyer, new upholstery in the dinette and a major hydraulic refit was carried out on the flybridge crane. Powered by twin 1,450hp Detroit Diesel engines, she cruises at 16 knots and carries more than 26,000 litres of fuel, enabling an extensive cruising range. Fair Skies was asking $775,000.